These are kept in a number of safe places but some of the most interesting are in regular use for members of the Livery and their guests to see at the quarterly Court Dinners. The Renter Warden, with the assistance of the Clerk, periodically reviews the Company’s treasures to ensure that they are safe and in good order. This bears the signature of King Charles II and bears his signature as well as his portrait. The parchment is traditionally shown to new members of the Company on joining. 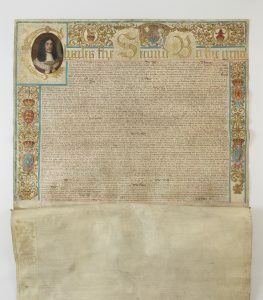 The Company also holds an earlier Charter dated 1635 but since it was not incorporated it is not held by the Company to be its founding document, though some authorities disagree. The Charters are kept at the Guildhall. This beautiful Salt was presented at the Court Dinner on 11 June 2014 by Past-Master and Father of the Company, Michael Nathan and his wife Liveryman Jenny Nathan MBE, to commemorate the Company receiving its charter from King Charles II in 1664. The engraver was Katharine Coleman MBE. The salt was blown to her design in two separate parts by Potter Morgan Glass of Altarnun in Cornwall. It is some 29cm high and 13cm in diameter and weighs nearly 2kg. It was blown in 24% lead crystal with a yellow glass overlay. 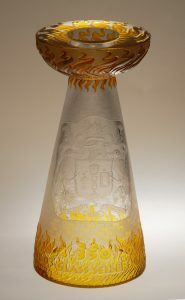 The top and the base were cut, polished and engraved separately, much of the yellow glass being cut away to the underlying clear crystal and re-polished. If required, the salt may carry a tea light and serve as a candlestick. The Ceremony of drinking from a Loving Cup passed around the table is observed at all Dinners. The three solid silver cups donated by previous Masters in 1687, 1765, and 1910 of differing handsome styles are always used as they symbolise continuity in the Company’s affairs but are usually supplemented by others, acquired more recently to speed up the ceremony. This always sits in front of the Master at Court Meetings containing a small amount of money and represents the essential nature of all Company Member’s personal commitment to give to Charity. 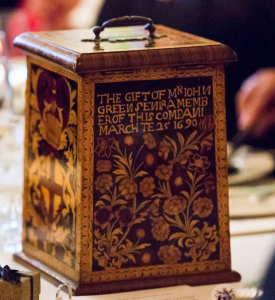 It is still used when Company Fines are due and is a particularly beautiful sample of wood and inlay craftsmanship given to the Company in 1690 by Past Master John Greene. The Master’s Chair is over 300 years old. Since it has never been refurbished and retains its original figured velvet upholstery it is only set out for the Master’s use at Court Dinners. It was the gift of Robert Crowshaw, Master in 1702. 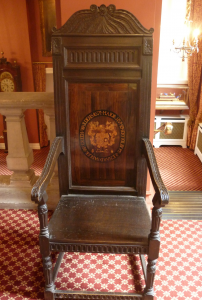 The Immediate Past Master’s Chair has an interesting history. It was a gift to the Company from Past Master Michael Nathan and his father Past Master Major CH Nathan. It is a modern reproduction chair but for the back panel which is made of rosewood and is inlaid to depict the names of the Master and Wardens of the Company in the year 1671. This panel was found by a Scottish antique dealer in 1974 and is believed to have originally been the inner lid of a chest used for storing the Charter and Company Ordinances. This chest is referred to in the Minutes of the Company dated 6th February 1672 and 22nd December 1698. This is one of the Company’s most valuable and unusual 300 year old Treasures. 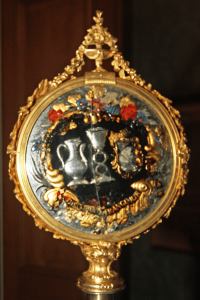 It was also a gift from Robert Crowshaw and comprises a glass panel showing the Company’s Crest surrounded by a cast silver gilt border and mounted on an ebony staff. Understandably the Beadle no longer slams it on the ground in order to bring meetings to order but it is still carried by him before the Master in all processions.